For people with astigmatism, corrective eye ware options can seem very limited. Astigmatism is a vision condition caused by the corneas not being perfectly round, but rather slightly oblong - similar in shape to a rugby ball. This irregular shape causes light to focus incorrectly inside the eye, resulting in blurry vision - especially when viewing small details.The variation in eye shape means that most standard lenses aren't going to offer them the specific corrections their eyes need. In the past, this can posed a serious challenge when shopping for contact lenses. The good news is that there are now many options available that are designed with astigmatism in mind. Contact lenses that correct astigmatism are called toric lenses. The shape of toric contacts is significantly unlike other types of corrective lenses, as they feature two different curvatures. This enables them to effectively treat the wearer's vision problems, for example myopia and hypermetropia, as well as their astigmatism. 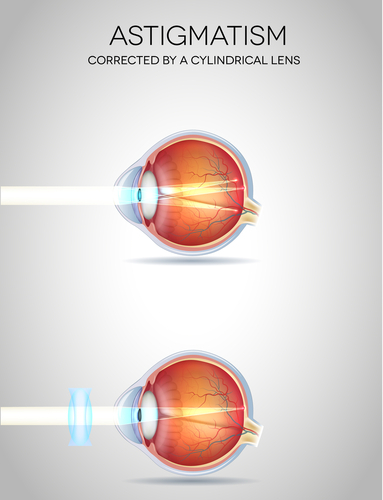 Because of the unique shape of toric lenses, it is essential for them to maintain the same positioning while on the eye - otherwise the wearer's vision will become blurry again. This is accomplished by manufacturing the lenses to be slightly thicker on the bottom. Whenever the wearer blinks, the movement of the eyelids realigns the lens on the eye, thus keeping them correctly placed.Another option, is for the lenses to be made thinner at the top and bottom. This orientates them correctly under the lids and results in a thinner more comfortable lens. What are the best Contact Lenses for Astigmatism? While astigmatism was once difficult to correct with lenses, the technology has vastly improved, meaning that most people can wear contact lenses with astigmatism. Today, there are many different types of toric lenses, including many of the same options you'd expect for other types of vision correction. A popular option for those who wear torics are toric daily disposables, for example, Dailies Aquacomfort Plus Toric or 1 Day Acuvue Moist for Astigmatism which provide the benefit of convenience, as you never have to worry about cleaning or otherwise caring for the lenses. This is also why many eye care professionals consider this option one of the most hygienic choices for your eyes. A few years ago daily torics could only correct fairly low values of astigmatism, but it is now common to correct up to 2.50D. Monthly disposables toric are also a very popular choice with consumers and can often correct over 3.00D of astigmatism, for example Acuvue Oasys for Astigmatism. For those who suffer from dry eyes, torics can also be provided in materials designed to relieve the itching and discomfort associated with the condition. Biofinity Toric is particularly well suited to dry eye conditions. As each person's eyes are completely unique, the sizing and fitting process may take some time and cost a bit more. However, wearing and being fitted with toric contact lenses has never been easier than it is today. Unlike soft contact lenses, rigid gas permeable (RGP) lenses don't flex to conform to the shape of the eye's surface. Instead, they hold their form, and effectively replace the astigmatic surface of the cornea with a properly shaped lens surface. This allows the lenses to correctly refract light entering the eye while compensating for astigmatism. There is also no need for the lens to be weighted like toric lenses, so they are free to rotate on the cornea without affecting vision at all. However, there is a limit to the amount of astigmatism (about 3 dioptres) that can be corrected with a standard gas permeable lens, without resorting to toric gas permeable lenses. Higher levels of astigmatism than 3 dioptres can easily be corrected with gas permeable lenses utilizing special back curves that have different powers in different directions. An added advantage of RGP lenses is that they offer much sharper vision than soft contact lenses. Their rigid structure allows them to hold a very specific shape. Soft lenses can bend very easily, which can alter the way light is refracted through. The difference can be small, but there are noticeable improvements, nonetheless. On the other hand, fitting RGP lenses can be a challenge. They take more time to get used to, and some people never become comfortable wearing them. Each lens is made to custom fit the patient's prescription, which makes them more expensive than soft lenses. This added cost can be offset with less frequent replacement of the lenses. Compromise can offer the best of both worlds. Hybrid lenses have a RGP center, and a soft ring around the edge. The rigid area in the middle provides incredibly clear vision, and fixes the problem of astigmatism, while the soft outer edge offers a comfortable fit. Because the lenses are thinner than regular RGP contacts, they are less noticeable to the wearer, and less likely to become dislodged. The average replacement schedule for hybrid lenses is longer than soft lenses, which helps to balance out the increased cost. Like any lens meant to address astigmatism, the fitting process will be more in-depth, and require an eye care practitioner with some experience to help you find the lenses that are right for you.